This is the project I was working on during the March thunder and lightening storm. The Seashell pattern is from http://www.i-bead.com’s Just bead’n Around, Designs from the heart by Amy Loh-Kupser. This is the project I was working on during the March thunder and lightening storm. The Seashell pattern is from www.i-bead.com’s Just bead’n Around, Designs from the heart by Amy Loh-Kupser. 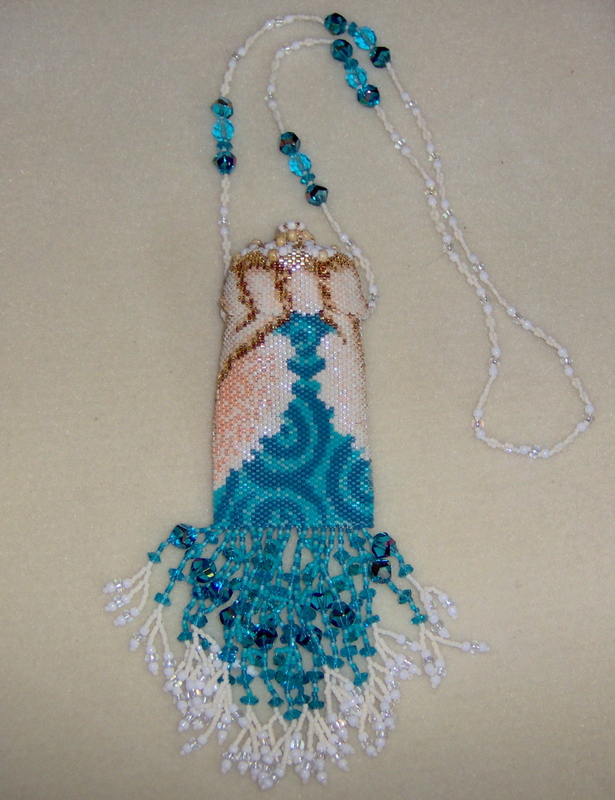 The main body of the seed bead amulet bag is done in a circular even count peyote stitch. Then the bottom is closed and fringe added. That was the easy part as was the necklace chain, my first attempt at a two-drop peyote stitch. The top part of the bag is a removable lid also done in even count circular peyote stitch. It decreases up to a crown of size 6 beads. That is where I had to grit my teeth and redo the rows over and over again, even though the instructions are well written. Finally it made sense but only after the storm when I could concentrate. Now you know why I wanted to finish this project. It took about a month to complete, although I have to confess there were a couple of weeks of procrastination. It was worth all my hard work. This is about the third project I have done from Amy Loh-Kupser’s patterns. Next on the agenda is her Hummingbird in Fuschias amulet bag. This time I’ll use white Silamide thread instead of 6# crystal Fireline as I want to see if the tension will be better overall. I’ll probably be doing a lot of beading in April as my computer continues to fall apart piece by piece by piece. Sigh. This entry was posted in Beading, Retirement Life and tagged Beadwork, Crafts, jewelry, Peyote stitch, Seed bead. Bookmark the permalink. Very cool! I love the colors. It’s a beautiful design too.